Or is he just happy to see me? 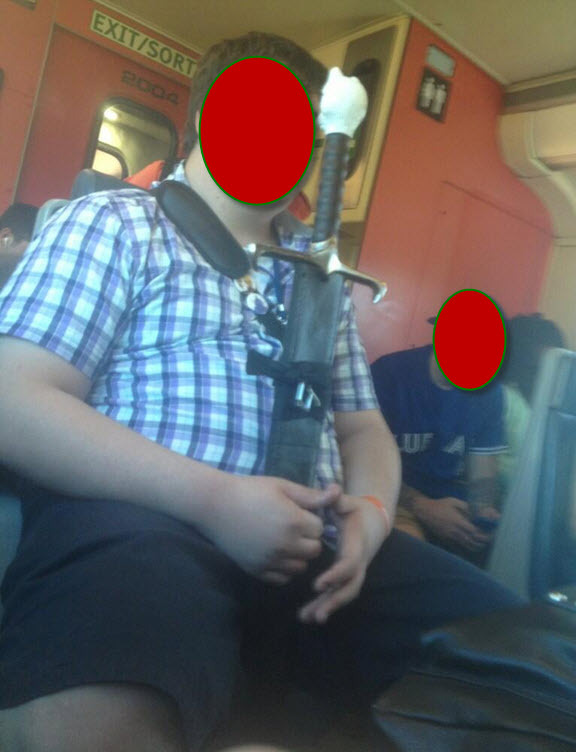 He could have been removed from the train for having that, as it is a weapon. Happens weekly! I saw a guy with a Japanese wakizashi sheathed on his back on the other day. In the Union Station subway stop. Am I going to have to start dueling with thugs over my wallet soon? Help Dial Up The Crazy! Tell me your crazy GO train or TTC story at cj@thiscrazytrain.com. Send pics/texts to 905-442-7423. Get to know your GO train donkeys! Peruse the dictionary. Got even more time? Visit the the ThisCrazyTrain.com banner gallery. GO Transit to the rescue! What's behind the fence?! This! For the love of all things holy! This Crazy Train (TCT) is published and authored for ENTERTAINMENT AND INFOTAINMENT PURPOSES ONLY. The contents of this website can only be republished and reprinted in any manner with written permission from the author(s) and photographer(s). TCT uses Photoshop and other sophisticated, high-end software to edit and manipulate pictures of individuals on this website. If your licence plate is visible on this site, stop parking like a jerk. Any use of real names, phone numbers or email addresses, unless permission was explicitly given, is accidental and coincidental. This website is not to be confused with GO Transit, a division of Metrolinx and thus, has no affiliation with GO Transit. I hope this disclaimer is big enough to read. If you need help with your eyesight, I recommend Dr. Lee. He's the best optometrist I've ever had. Find him in the Yellow Pages under Eye. 2010-2018 Cindy J. Smith |. Awesome Inc. theme. Powered by Blogger.